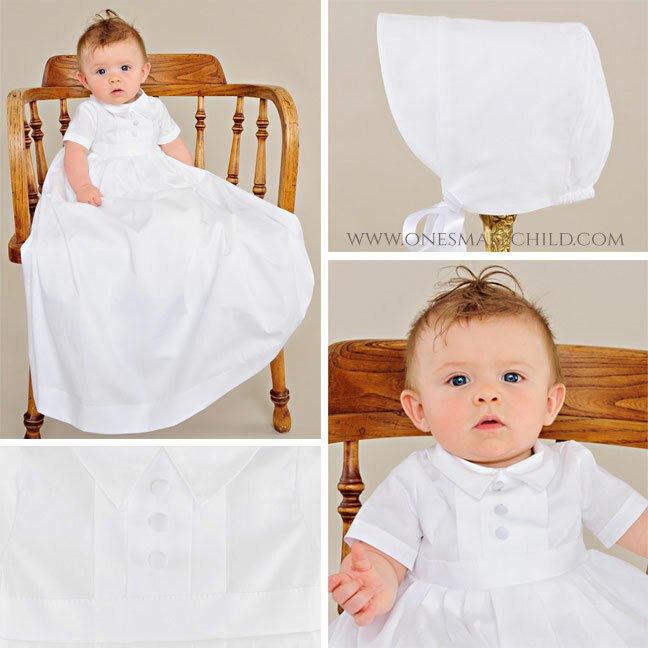 Have you browsed our boys Baptism outfits lately? 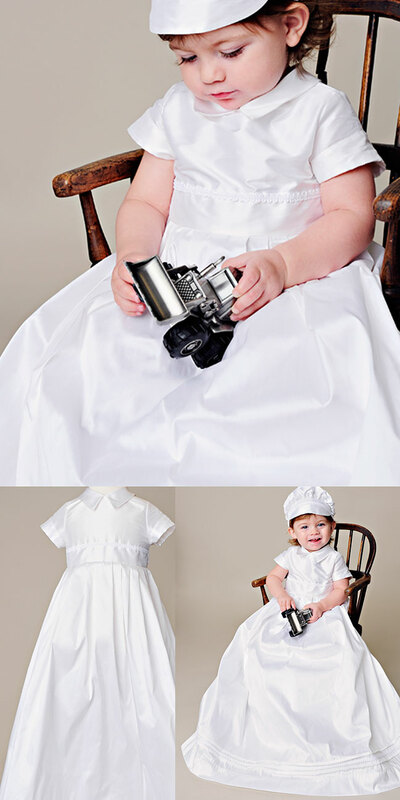 We have a great selection of Christening gowns that are perfect for your bouncing baby boy! 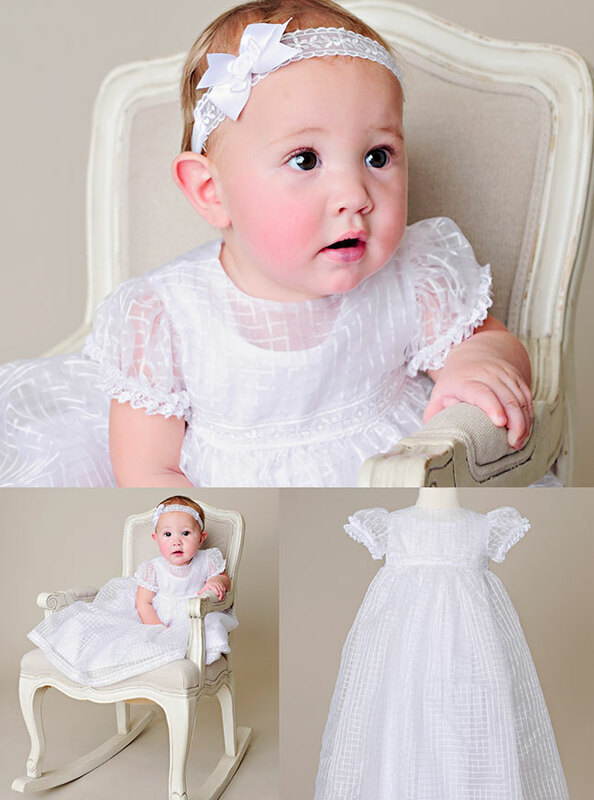 Our Caleb Christening gown is designed with both comfort and style in mind. Made from a light-weight cotton fabric (that is machine washable! ), it’s a smart summer option. The masculine bodice features a classic pointed shirt collar, bold pleats and covered buttons. The heirloom-length skirt is finished with a lush, thick hem. A cotton slip and simple visor bonnet tops off his handsome look. What a great traditional outfit for your little guy! Looking for a traditional silk Baptism gown for your little man, but longing for the style of a modern gentleman? Get the best of both worlds with our William Gown! The William christening gown is made from luxurious dupioni silk and features simple styling and a lavish heirloom length. Silk covered buttons decorate the visor hat. Fabric pleats and braided trim adorn the bodice and hem. We love the beautiful simplicity this gown offers and we know you will too! Finding the perfect garment for your son’s baptism day is a big part of planning for his once-in-a-lifetime event. This religious celebration is traditionally attended by extended family and friends who will undoubtedly take numerous photographs of the new infant, so you want to be sure to shop for something that looks great and also reflects your style. 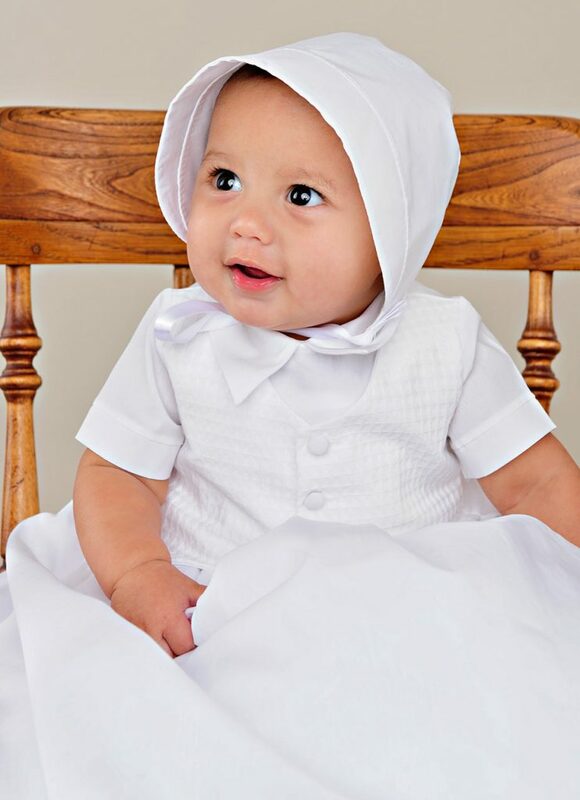 To accommodate you, we have created a wide assortment of handsome baptism outfits for boys at One Small Child, in a variety of fabrics and styles. Some parents want a traditional long white ceremonial gown made for boys for religious ceremonies such as baptisms. Other parents and grandparents prefer a christening romper that is more masculine, with tailored details. We are pleased to create ceremonial gowns for baby boys: finely crafted and classic garments made from high-quality silk and cotton fabrics that reflect the importance of their purpose. Fabric choices can be influenced by several factors, including tradition, season, and personal preference. For a hot summer-time religious ceremony, you might want a gown in lightweight cotton with a uniquely woven embellishment on the sleeves and near the hemline or a simple one-piece white cotton romper. Shimmering silk, lustrous satin, and cozy sweater knits make perfect baptism outfits for boys being baptized when the weather is cool. If colder temperatures are in the forecast, parents can purchase matching sweaters, jackets or coats featuring the same textiles and trims offered on the outfits themselves. While the styling of our baptism outfits for boys tends to be classic and simple, most items feature details that add significantly to the ‘cute factor’, including menswear-inspired pointed collars and pleats, textured fabrics, fabric-covered buttons, subtle entre-deux inserts, and glossy braid trims. Some styles offer a contrasting blue embellishment, which provides subtle pops of color at the waistline, across the brim of the hat, and the toes of the matching shoes for a well-coordinated, put-together look. 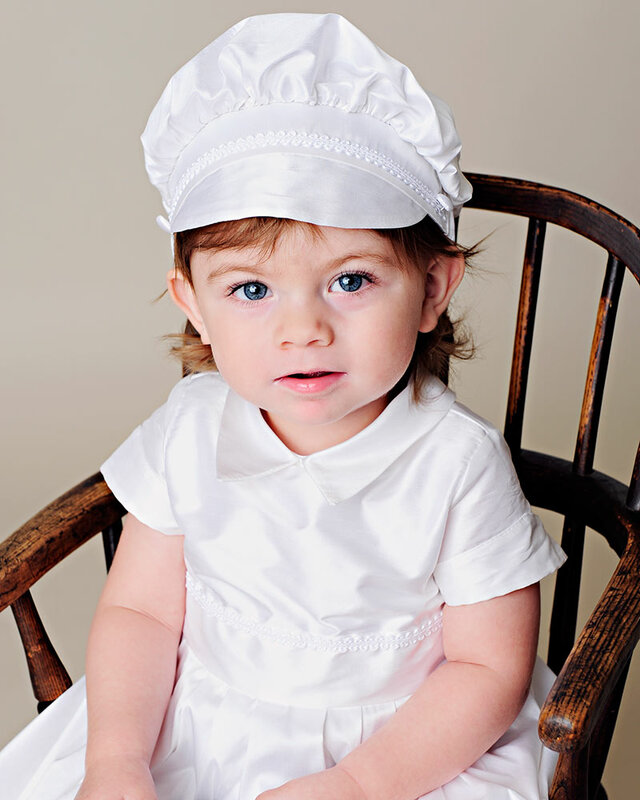 Your little boy will look absolutely handsome in his baptism outfit look, smartly finished by a coordinating hat. Styles included in our collection include jaunty visor caps, cute berets, and traditional visor bonnets. 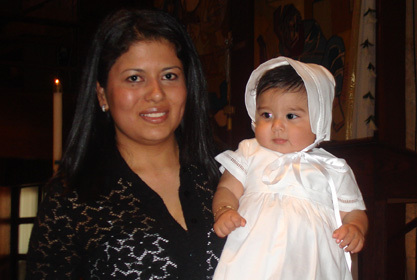 You can opt to add a personal embroidered detail to the baptism hat. Styles offered include Baby’s name, monogram, cross, or shamrock. Also available is a large selection of matching socks, shoes, bibs, blankets and more! You’re sure to find everything you need to present a fully equipped baby to friends and family on an unforgettable day.